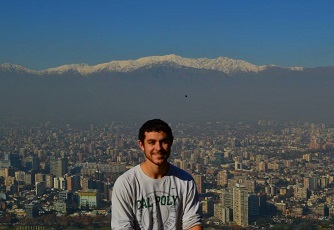 Many students in the Honors Program take advantage of the study abroad programs that Cal Poly has to offer. There are dozens of available programs offering a wide range of cultural and academic opportunities. Students who study abroad develop an appreciation for diverse cultures while being immersed in a new community. Students also develop a new perspective upon their return to Cal Poly. The Honors Program encourages students to study abroad and offers opportunities to earn Honors credit for the experience. The Honors Program has partnered with Cal Poly Study Abroad and the International Center to create an Honors experience in London for the summer of 2016! Travel to London is very popular with Cal Poly students, offering the unique opportunity to study in one of the world’s greatest capitals. This year, over 50 Cal Poly students will participate in the 6-week summer program, and eight of these students will represent the Honors Program! Faculty members teaching in London typically forgo the traditional lecture, offering fantastic opportunities for students to explore and learn about the city. This summer promises to offer similar experiences. We are extremely fortunate to have partnered with Professor Josh Machamer to teach an Honors seminar linked with this Global Theatre course. As part of the seminar, Honors students will work in small teams with Professor Machamer to investigate community theatre productions throughout the city. This will most certainly be a once-in-a-lifetime “learn by doing” experience! The Honors Program is excited to announce we will be providing more Honors Abroad opportunities in 2017. Please stay tuned for more information about other great opportunities that will be available for our students. "Studying abroad forced me to adapt to new environments and situations, molding me into a more capable independent individual. Also, it enhanced my overall college experience, immersing me in the fascinating Catalan culture and allowing me to finally put my Spanish to use. I had an exciting opportunity, which took my learning to the next level." "Studying abroad allowed me to immerse myself in a language and culture much different than my own. I had the opportunity to put into practice all the language classes I'd been taking at school, as well as gain a global experience that just can't be taught in the classroom." Here are just some of the locations Honors students have recently studied abroad. Visit Study Abroad for a full list of possible destinations.